The esteemed British Interplanetary Society is resurrecting an ambitious idea for creating giant orbiting homes in space. But to make it economically and technically feasible, it will have to rely on a plan devised by Gerard O'Neill back in the 1970s. The BIS, as some of you may know, came up with a plan back in the 1930s to send a multi-stage rocket and a manned lander to the moon. It was eerily reminiscent of the Apollo Mission that came some 30 years later. This think tank has a history, so it would be smart to take these guys seriously. Now, as BBC Future reports, Jerry Stone of BIS's SPACE (Study Project Advancing Colony Engineering) is trying to do something similar — to show that building a very large space colony is technically feasible. 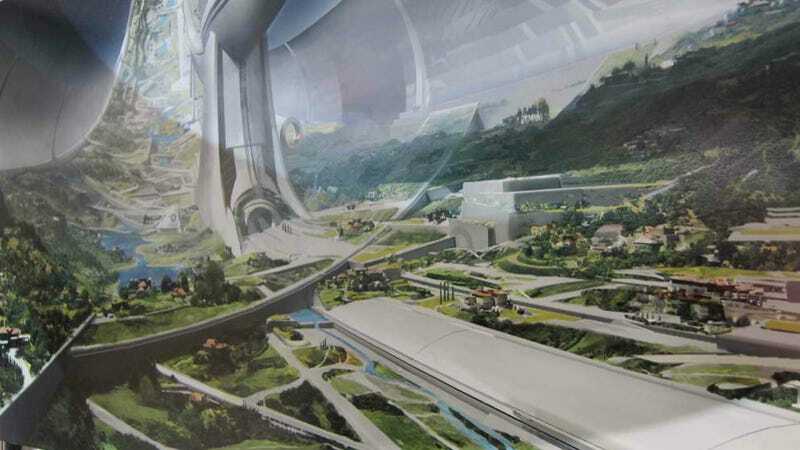 The plan would call for space-based human habitats consisting of giant rotating spaceships containing landscaped biospheres that can house up to 10 million people. The scheme is commonly referred to as an O'Neill cylinder and similar to the ones portrayed in Babylon 5 and Elysium. O'Neill deliberately designed the structure using existing 1970s technology, materials and construction techniques, rather than adopting futuristic inventions. The hollow cylinder, for instance, was based on steel and aluminium. After detailed calculations, he claimed his concept was feasible at the time he published it. Stone is bringing these plans up to date using today's technologies. Rather than building the shell from aluminium, for example, Stone argues tougher and lighter carbon composites could be used instead. Advances in solar cell and climate control technologies could also be used to make life easier and more comfortable in human space colonies. One of the biggest theoretical challenges O'Neill faced was the effort and cost of construction. That, says Stone, will be solved when a new generation of much cheaper rocket launchers and spaceplanes has been developed, such as the UK-built Skyon. Using robot builders could also help. "Ninety per cent of the material to build the colonies would come from the Moon," says Stone. "We know from Apollo there's silicon for the windows, and aluminium, iron and magnesium for the main structure. There's even oxygen in the lunar soil." Quite obviously, the BIS doesn't have the means to fund such a project, but Stone is hoping that a consortium of corporations and/or some adventurous multi-billionaires will chip in. Read more at BBC Future where Hollingham describes the plan and the O'Neill Cylinders in much greater detail.